18:67 He said, “Indeed, with me you will never be able to have patience. 18:78 [Al-Khidh r] said, “This is parting between me and you. I will inform you of the interpretation of that about which you could not have patience. Some misguided individuals have distorted the above passage and claim that it sanctions ‘Honour killing’. They have taken this innocent story and taken it apart that ‘a father can kill his son’ without getting punished under Islamic Law. To some this story might sound strange, why would Khidr kill a kid? According to majority of scholars of the past and present, they have stated that if the kid had grown up, he would have oppressed and turned his innocent parents who were believers to disbelief. According to Scholars (read commentary of Scholar Sayyid Abul Ala Maududi below), Khidr was not a human being but an Angel (or other kind of creation). Human beings are forbidden to do such. Under Islamic Law, a parent is forbidden to kill his son or daughter. In one of our early Hadith, Prophet Muhammed (p) has stated that a parent is not allowed to kill one of their own children, and if a parent does so, then there will be legal punishment carried out on the father or mother. Reading the above Prophetic saying, it is abundantly clear that ‘honour killing’ is not endorsed in Islam. In connection with this story, a very hard problem arises to which an answer must be found: Two of the three things done by Hadrat Khidr are obviously against those commandments of the Law which have always been in force since the creation of man. No law allows anyone the right to damage the property of another and kill an innocent person. So much so that if a man were to know by inspiration that some usurper would illegally seize a certain boat, and that a certain boy would be involved in a rebellion and unbelief, even then no law, sent down by Allah, makes it lawful that one should bore a hole in the boat and kill the innocent boy by virtue of one’s inspiration. If in answer to this, one were to say that Hadrat Khidr committed these two acts by the Commands of Allah, this does not solve the problem, for the question is not this, “By whose command did Hadrat Khidr commit these acts”? but it is this: “What was the nature of these commands”? 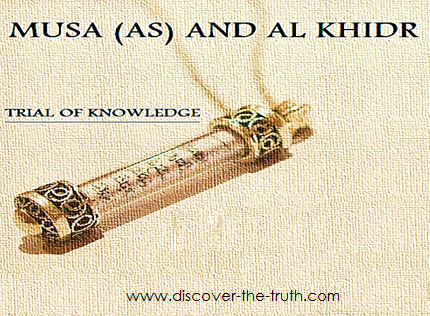 This is important because Hadrat Khidr did these acts in accordance with Divine Command, for he himself says that these acts of his were not done by his own authority, but were moved by the mercy of Allah, and Allah Himself has testified this by saying: “We gave him a special knowledge from Ourselves”. Thus it is beyond any doubt that these acts were done by the Command of Allah, but the question about the nature of the command remains there, for it is obvious that these commands were not legal because it is not allowed by any Divine Law, and the fundamental principles of the Qur’an also do not allow that a person should kill another person without any proof of his guilt. Therefore we shall have to admit that these commands belonged to one of those decrees of Allah in accordance with which one sick person recovers, while another dies: one becomes prosperous and the other is ruined. If the Commands given to Hadrat Khidr were of this nature, then one must come to the conclusion that Hadrat Khidr was an angel (or some other kind of Allah’s creation) who is not bound by the Divine Law prescribed for human beings, for such commands as have no legal aspect, can be addressed to angels only. This is because the question of the lawful or the unlawful cannot arise about them: they obey the Commands of Allah without having any personal power. In contrast to them, a man shall be guilty of a sin whether he does any such thing inadvertently by intuition or by some inspiration, if his act goes against some Divine Commandment. This is because a man is bound to abide by Divine Commandments as a man, and there is no room whatsoever in the Divine Law that an act may become lawful for a man merely because he had received an instruction by inspiration and had been informed in a secret way of the wisdom of that unlawful act. The above-mentioned principle has been unanimously accepted by scholars of the Divine Law and the leaders of Sufism. `Allamah Alusi has cited in detail the sayings of ‘Abdul Wahhab Shi`irani, Muhy-ud-Din ibn-`Arabi, Mujaddid Alf Thani, Shaikh ‘Abdul-Qadir Jilani, Junaid Baghdadi, Sirri Saqti, Abul-Hussain An-nuri, Abu Said-al-Kharraz, Ahmad ud-Dainauri and Imam Ghazzali to this effect that it is not lawful even for a sufi to act in accordance with that inspiration of his own which goes against a fundamental of law. (Ruh-ul-Ma ani, Vol. XVI, pp. 16-18). That is why we have come to the conclusion that Hadrat Khidr must be an angel, or some other kind of Allah’s creation, exempted from human law, for he could not be the only exception to the above-mentioned formula. Therefore we inevitably come to the conclusion that he was one of those Servants of Allah who act in accordance with the will of Allah and not in accordance with the Divine Law prescribed for human beings. “Henriette Karra, from a Christian family, had filed a complaint against her parents, saying her mother threw a pot at her because she objected to her seeing a Muslim boy”.